We first met Vera Balyura three years ago shortly after the launch of her jewelry collection, VERAMEAT. At the time, Balyura was peddling her cheeky dinosaur necklaces and animal charm jewelry at Williamsburg's Artists & Fleas Market, and delightedly explained the origins of a glinting gold T-Rex ring that caught our eye. "He's eating fried chicken," she pointed out. "It's sort of cannibalistic, actually, since some dinosaurs eventually turned into birds." Since then, Balyura's kooky-chic collection has earned fans in the likes of Tilda Swinton ("she bought the first ring I ever made") and Zach Galifianakis. Tremendous mass-market success with wholesalers like Urban Outfitters verified what devotees already knew: that cute, animal-inspired jewelry doesn't have to be simplistic or childish. "People like the spine rings, or the seahorses kissing have been really popular," she explains. "But the Hippo Shark necklace has been a big hit. It's a half-hippo, half-shark eating a hot lady in a fur dress hitting him over the head with a bone club." If that isn't enough narrative, the victim's missing arm can be found in a second piece: a T.Rex pendant gnawing her severed remains. "I have customers who wear both pieces together." 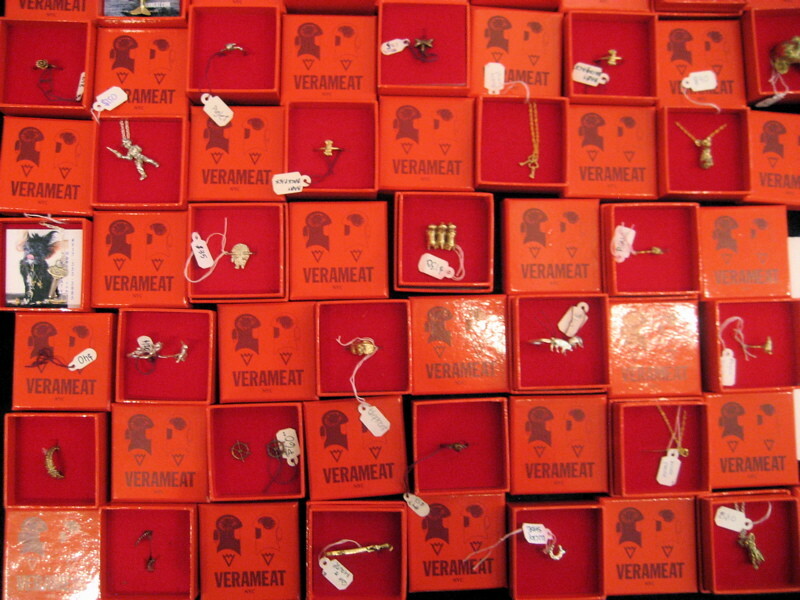 This is the wacky world of VERAMEAT, and come July 2nd, fans can explore it in person at a new East Village boutique stocked with hundreds of tiny red boxes housing her sweet-yet-clawed creations. "I just think some days, we feel like being cute and wearing a little heart ring, and other days you have to wear a dinosaur skeleton." Reasonable enough, and for all her collection's apparent zaniness, Balyura's designs were originally conceived out of a simple desire to create subtle, smart jewelry that would physically fit the tiny fingers she inherited from her mother, a former concert pianist. "I'm my own customer," she says. "It's convenient, because I don't have to do any creepy surveys of people who are in my market or anything. My fingers are really small -- my index finger is like a [size] five and my ring finger is a [size] four or something -- and I could never find anything cool that would fit me." While the collection has evolved to include a full range of sizes, its inspirations are still pure Vera. "I really want to start doing cute monsters," she says. "You know, maybe a little pig with way too many legs." As her empire expands (a debut collection of ready-to-wear with friend and designer Rebecca Turbo is slated for her store opening), its easy to see the VERAMEAT line evolving into something as covetable and personable as fellow New York jewelry-designer, Pamela Love. "To me, I think I'm simple," says Vera. "Some people think I'm very eccentric but I always thought I was simple. I want people to look closer and see that these pieces are actually really interesting and unique." Much like Miss Meat herself.